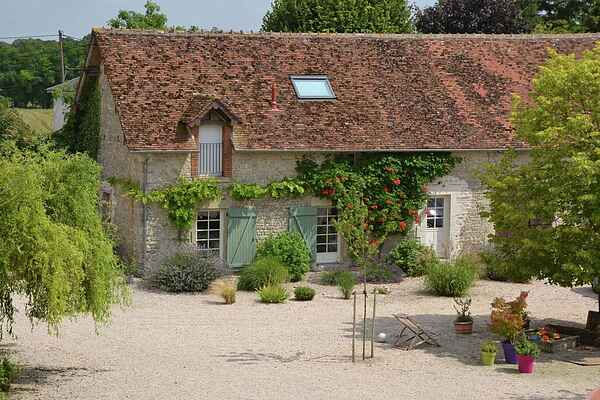 This authentic holiday home is part of the Domaine La Grande Gervaise. It is located near the town of Chilleurs-aux-Bois (800 m). In the backyard you'll find a private, beautifully furnished terrace with barbecue and two sun beds. The garage is equipped with a ping-pong table. A jeu de boules set is also included. The house provides many fun activities for the children too. In no time you can make a trip to the bakery and the grocery store. The environment inspires you to become active. That's why four bikes (two of which are children's) are included. You can experience numerous pleasant trips through the forest of Orléans (2 km). A fantastic panorama awaits you at Le Belvédère des Caillettes, which has the nickname 'the wooden Eiffel Tower.' You also shouldn't skip a visit to the gorgeous Château de Chamerolles (3 km), where you'll find an intact drawbridge and incomparable gardens. A little further you'll find Yvre-le-Châtel (22 km), which has been classified as one of France's most beautiful places. You'll recognise this place by it's splendid city walls, castle, and the limestone houses. You'll find a fishing like and a tennis court in Chilleurs-aux-Bois. The house of the owners is on the same property as well. But this won't cause any inconveniences.